It suddenly occurred to me that it had been a while since I'd done a giveaway. Gasp! Don't worry, I'm going to remedy that right now. What are we celebrating? Well, I survived had a great time at RWA Nationals, I just got the cover for the upcoming Baba Yaga novella, Wickedly Ever After (it needs a few tweaks, but I'll share it when it is finalized), and I found out that both Baba Yaga book 3 (Wickedly Powerful) and the non-Baba urban fantasy I have coming out in November as an ebook (Veiled Magic) are up on Amazon for pre-order. And probably other places, too. There isn't any info up yet, but they're there. Naturally, I'd love it if you would run out and pre-order one or both of them, since that makes me look good to my publishers :-) But you don't have to. As always, all you have to do to enter is pick an option or option from the form below. The winner will also get a Wickedly Wonderful mug and this cool dragon necklace, in honor of Chudo-Yudo, the dragon in the stories. Feel free to spread the word, and don't forget that good reviews are the best gift you can give to an author (after buying the books, of course). Good luck! I'm sorry I haven't been around much, but I have a good excuse. First I was madly prepping to go to the Romance Writers of America (RWA) National Convention. This means writing like a crazy person to make up for the fact that I was going to lose five days of writing time (I normally write almost every day). And trying to figure out what the heck to wear, and then packing, and then (gulp) five and half hours on the bus to NYC. There are a number of reasons I go to the Nationals every few years. There are good workshops, and it is a great opportunity for networking. For me, though, the best part is the people I get to see that I don't have the opportunity to meet up with anywhere else. This was my third time attending, and in many ways it was very different from previous conventions. The first one I went to, in Washington, DC, I was just starting out in the fiction field, still looking for an agent. The second one, four years ago in NYC, I had my agent (the wonderful Elaine Spencer), but we hadn't sold a book yet. This year was my first time attending as a published author. This meant I got to take part in both the Literacy Signing Wednesday night (an insane mob scene also open to the public) and the Berkley signing on Friday for conference-goers only. I love having piles of my books! And they all disappeared in the first hour! Of course, it was a crazy hectic manic rush from the minute I got there. But I did get to see agent/author pal Lucienne Diver after the signing on Wednesday, where she convinced me to go to the Coastal Magic convention next February in Florida. Then I had lunch with Elaine and we took part in a panel that featured agents and authors from The Knight Agency...and didn't manage to remember to get a picture of either. Sigh. She took me to a yummy Mediterranean restaurant called Kellari Taverna and we shared a bunch of appetizers including lamb riblets, and the most delicious flaming cheese. No, really. They soaked it in something like brandy and set it on fire. It was delish! That's the cheese in the cast iron pan, no longer flaming. On Friday, I got to go to two different workshops given by my favorite author, Jennifer Crusie. 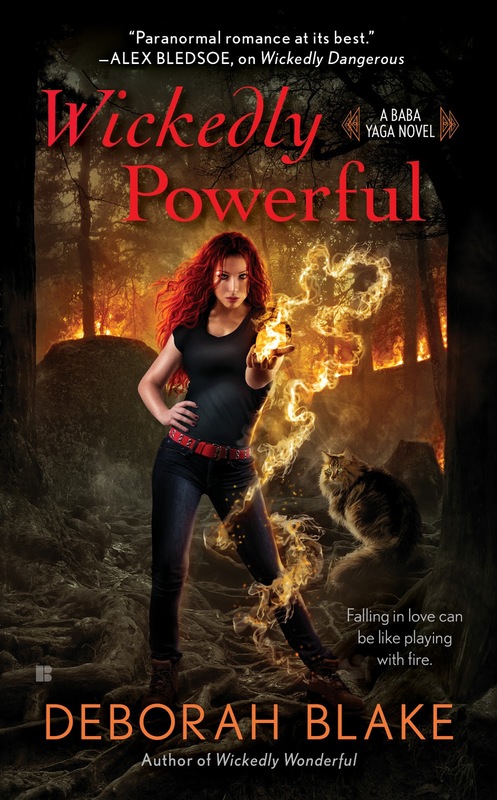 Jenny is not only a terrific author, she is a great teacher, and I credit her "Turning Points" workshop (that I went to at my first RWA, and then again this time) with improving my writing to the point where I finally got an agent. I started a standing tradition at that first Nationals of stalking her throughout the conference and giving her chocolate. (If you're going to stalk someone, you should at least make it worth her while.) This time I brought her handcrafted chocolates made by a local chocolatier. Yum. I also got to finally meet the lovely Patience Bloom, who is both an editor for Harlequin and the author of a funny, sweet, and poignant memoir called Romance is My Day Job (all about her real life love story), which I recently read and loved. And of course, there was New York City. I'm not a city girl, myself, but you have to admit it is pretty splendid. I had a lot of fun, ate some wonderful food, and met up with a whole bunch of terrific people. But I was still really glad to get home to the kitties and you people. I suspect we'll celebrate with a giveaway sometime this week. Just because. Where is the last interesting place you traveled to? Are you a journeyer or a homebody like me? Almost everyone has health issues now and again. Some unlucky folks have chronic pain or disabilities, or are surprised with a sudden unpleasant diagnosis that turns their lives upside down. Whether it is something small and annoying or large and disruptive, health issues can a pain in the, well, pain. Those who have to deal with such things (me included) use whatever tools they can to help themselves heal. Sometimes that means doctors and medicine, sometimes it means increasing your exercise and changing your diet, or taking up meditation, or making sure your life is more balanced. For anything major, it usually means all of those and more. And sometimes, magick can help too. Remember, spells are a way of focusing our intentions and using our will to send those intentions out into the universe. Like prayers, they give us a way to ask for help and guidance, too. Between my own issues the last few weeks (I'm look at you, Migraine that Would Not Die) and a friend's cancer diagnosis, I've had health issues on the brain. Literally, in my case. So I decided to share two spells from my third book, The Goddess is in the Details (the precursor to my newest book, Everyday Witchcraft)*. The first spell is one to bring in health, and therefore is best suited for use during the full moon or waxing (growing larger) moon. The second spell is one to banish illness, and is best suited for use during the new moon or waning moon. If you plan to do these repeatedly over the course of a number of days, as I do when something is really problematical, you can start with one and then shift to the other as the moon changes. I wish you good health and hope that, if worse comes to worse, and you end up with health issues of your own, you will find these helpful. I have to start by apologizing to all my friends who live in drought country, since we've had rain on and off for weeks here. Which is both good and bad, when it comes to the garden. Things are growing well, including the weeds, of course. The view from outside my back door. The left side of the garden, including a new strip of plastic mulch. You can see the garlic plants off to the left, corn and cukes straight ahead, and broccoli, parsley, basil, and dill to the right. Plus weeds, of course. These are soybeans on the left and potatoes on the right. They seem to be trying to meet in the middle. In the background you can see squash and beans, ditto. A lovely head of broccoli ready to be harvested. Tomatoes and eggplant. Those yellow leaves on the eggplant mean its not happy about the lack of sun and heat. More tomatoes. They have the beginning of blight because of the constant rain. Sigh. In some ways, the garden this year is a good representation of my life: it is mostly growing well, but man, it is impossible to keep up with, some stuff is getting away from me no matter how hard I try, and occasionally, there is blight. How is your garden (actual or metaphorical) growing this summer? I'd really like to know. Also, have a cute frog sitting on a big lily pad in the garden pond. For those who don't get my newsletter, here is the reveal of yet another cover. 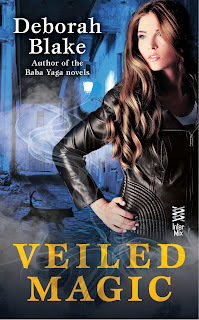 Introducing VEILED MAGIC! VEILED MAGIC is a non-Baba Yaga book. I wrote VEILED MAGIC a number of years ago—in fact, it was the book that got me signed with my agent, Elaine Spencer, who really loved it. But for whatever reason, we couldn’t sell the book back then, so Berkley bought it now and will be putting it out in November to give my readers something to hold them over until the next Baba Yaga book is out in February. Unfortunately for those of you without e-Readers, VEILED MAGIC will only be out in eBook form initially. (You will still be able to download it and read it on your computer.) But take heart; if it sells well enough, they'll put out a print version too. And if it really sells well, they'll continue the series. So be sure to spread the word when the book comes out! In a world not too different from ours, a Witch-cop just trying to do her job stumbles across a long lost relic and gets caught up in an ancient war between the paranormal races and a renegade arm of the Catholic Church. With the help of a half-dragon forger, a mischievous kobold, and a disgraced shape-changer, she must solve the puzzle of an explosive secret before it can be used to destroy the very fabric of the society in which she lives. 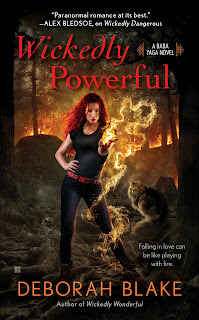 I just finished writing WICKEDLY POWERFUL and it is off to my editor! Now I am hard at work on the next book in the series, which will feature the first of the Riders, Mikhail Day. 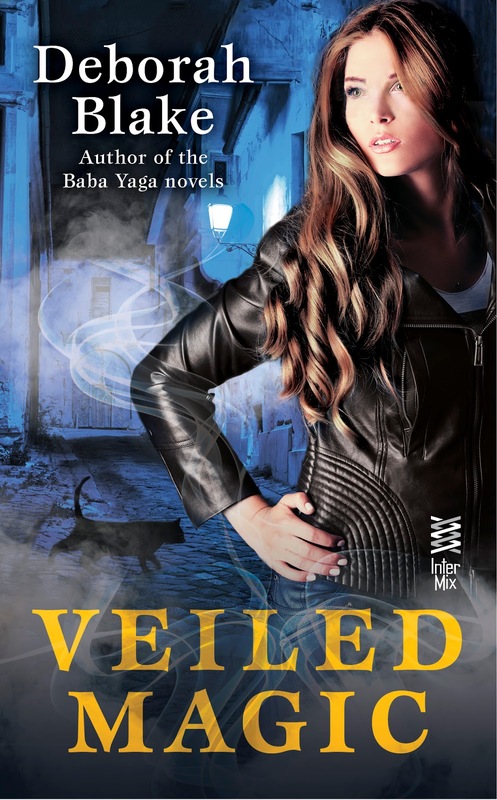 So what do you think--will you read VEILED MAGIC even though it isn't a Baba Yaga book? I'm going to be putting out my (more or less) quarterly newsletter this coming Monday--are you signed up yet? There are a couple of reasons why you might want to be. For one thing, I'm going to give my newsletter folks first look at the newest cover reveal, and a sneak peek at something new and different that's coming up. I almost always give important updates in the newsletters, so that way you don't have to worry about missing something if you don't happen to make it here to the blog. However, I'm also doing something else to encourage people to start getting the newsletter: I'm going to be doing a contest that is ONLY available inside the newsletter itself! How fun is that? If you haven't signed up for the newsletter yet, it is easy peasy to do so--just fill out the form on the top left of the blog (or you can sign up on my website too, but hey, you're here already, right? ).